Saint Euphrasia, born in Constantinople, was the daughter of noble and pious parents, honored by the pious Emperor Theodosius and the Empress of that city. After the early death of Antigonus, her father, her mother consecrated her widowhood to God, and retired with their only child into Egypt, where she possessed a very large estate. In those days there were many monasteries of nuns as well as of holy cenobites; in one single city there were twenty thousand such holy women, consecrated to Jesus Christ. Euphrasia's mother chose to reside near a monastery of one hundred and thirty nuns, which she often visited, accompanied by Euphrasia. When the little girl, seven years of age, begged that she might be permitted to serve God in this monastery, the pious mother wept for joy. Then the mother led her before an image of our Redeemer, and lifting up her hands to heaven said, Lord Jesus Christ, receive this child under Your special protection. It is You alone whom she loves and seeks; to You she recommends herself. Then leaving her in the hands of the abbess, she went out of the monastery weeping. She continued her life of prayer and mortification, and a few years later, when this good mother fell sick, she slept in peace. On receiving the news of her death, Theodosius sent for the noble virgin to come to court, as he considered himself her protector, and already during her childhood had arranged for her to be married to a young senator of Constantinople, when she would reach a suitable age. But the virgin wrote him, refusing the alliance, repeating her vow of virginity, and requesting that her estates be sold and divided among the poor, and all her slaves set at liberty. The emperor punctually executed all her wishes, shortly before his death in 395. Saint Euphrasia was a perfect pattern of humility, meekness, and charity. 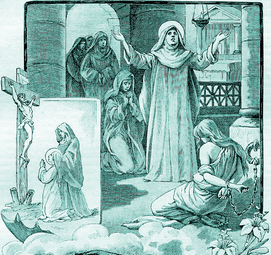 If she found herself assaulted by any temptation, she immediately sought the advice of the abbess, who often on such occasions assigned to her some humbling and painful penitential labor, which she would execute to perfection. Once she moved a pile of great rocks from one place to another, continuing for thirty days with wonderful simplicity, until the devil, vanquished by her humble obedience, left her in peace. She became powerful over the demons, and delivered many possessed persons. She cured a child who was paralyzed, deaf and dumb, making the sign of the cross over him and saying, May He who created you, heal you! She was favored with other miracles also, both before and after her death, which occurred in the year 412, the thirtieth of her age. The harvest is great, but the laborers are few.